The AAP’s Caring for Your Baby and Young Child suggests yogurt as a healthy food for babies and toddlers as early as 8 months old. Most young babies begin life nutritionally sound with breast milk or an approved formula. Most make a smooth transition to healthy first cereals, fruits, and veggies. But during the transition from baby foods to table foods, and during toddlerhood, many American children start to fill up on tempting but empty calories. Too often, parents don’t think of yogurt during this critical time. The AAP Committee on Nutrition says that nonfat and lowfat milk products are not recommended during the first 2 years of life. Fat is important for brain development during the first 2 or 3 years. Full fat yogurt designed for infants and toddlers is available. Yogurt is a nutritionally dense food that many kids love. It contains more calcium than milk. The calcium benefits alone are reason enough to choose yogurt.Why Else Choose Yogurt? The power of yogurt in the fight against infections is solidly established. The Cochrane DARE (Database of Reviews of Effects) in their July 2003 review and analysis of 9 randomized, double-blind, controlled studies of probiotics, either as food or supplements, concluded that these beneficial bacteria included in yogurt are effective at preventing diarrhea associated with antibiotic use. I recommend for most healthy children that whenever they take antibiotics they also take probiotics to replenish the gut flora and to safely prevent side effects. A new approach to otitis media. Many studies demonstrate the power of yogurt to prevent and treat gastrointestinal infections, including those caused by rotavirus, salmonella, shigella, and E. coli. But these anti-infective benefits extend beyond the GI tract. A study of 571 children published in JAMA. (Sep 20, 2000) demonstrated a significant reduction in sinusitis, bronchitis, and pneumonia in the children taking Lactobacillus. 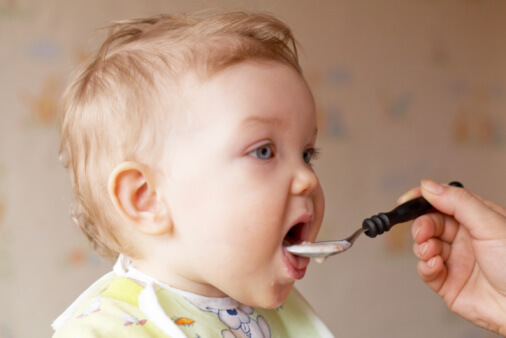 Giving children food that contains Lactobacillus appears to decrease the rate and severity of respiratory infections of kids in daycare, according to a study in the June 2, 2001 issue of the British Medical Journal. Healthy children between the ages of 1 and 6 who attended daycare were randomly assigned to receive a regular diet or the same diet with added Lactobacillus in the food over the 7 months of the study. The study was carried out in 18 different daycares. Those who got the Lactobacillus milk missed daycare due to illness 11% fewer times. They had 17% fewer complicated respiratory illnesses, and needed 19% fewer courses of antibiotics. Could something similar work in the ears? Researchers in Sweden selected a group of 108 ear-infection prone children, and gave half of them a nasal spray containing a live culture of beneficial bacteria. The others received a placebo nasal spray. Each received two 10-day courses. The results were published in the January 27, 2001 British Medical Journal: at the end of 3 months nearly twice as many of the bacteria group were healthy and otitis free. Recent exciting evidence suggests that probiotics can help prevent asthma, atopic dermatitis, and allergic rhinitis. Probiotics and prevention of atopic disease: 4-year follow-up of a randomised placebo-controlled trial. Baby soft, smooth skin in young children could be partly the result of what their mothers ate during pregnancy and nursing, according to a study reported in the May 31, 2003 issue of The Lancet. Beneficial bacteria, such as those found in active culture yogurt, acidophilus milk, or probiotic supplements appear to be a gentle way to provide lasting protection against eczema. For four years, investigators in this study have followed more than 100 children who were at high risk to develop eczema. All of them had a strong family history of eczema. Their pregnant mothers were given capsules that either contained active cultures of beneficial, probiotic bacteria or an empty placebo. For the first six months after delivery, the nursing mothers continued to take these capsules. Bottle-fed babies got either the active cultures or the placebo in their bottles. The results were striking. Throughout infancy, toddlerhood, and the preschool years – up to the 4th birthday, so far — those children who had been in the probiotic group were significantly less likely to develop eczema. There was a 43 percent reduction in eczema over the placebo group. Probiotics have been shown to benefit the developing immune system in a number of ways, from preventing and treating infections to preventing allergic reactions such as eczema. Cesarean Delivery & Food Allergies. Children born by C-section to allergic mothers are more than 4 times more likely to develop proven egg allergies than are peers born vaginally, according to a fascinating study in the August 2003 Journal of Allergy and Clinical Immunology. Parents of these children were more than 7 times more likely to report the children developing allergies to egg, fish, or nuts. What could cause this? C-section delays the colonization of the baby’s gut with beneficial bacteria. Research like that described above has shown that these beneficial bacteria help prevent allergies and improve immune function. I strongly recommend breastfeeding, and all the more so for children born by C-section. Breastfeeding promotes beneficial bacteria in the gut. Earlier research suggests that mothers taking active cultures of beneficial bacteria during the third trimester and during nursing can help prevent allergies as well. A Link Between Antibiotics and Asthma. Is there something parents can do to change whether their children will get asthma? Babies who received a course of antibiotics during the first six months of life are 2.5 times more likely than their peers to have developed asthma by age 7, according to a Henry Ford Health System study. And babies who took even one round broad-spectrum antibiotics were 8.9 times more likely to acquire asthma. The study, presented at the European Respiratory Society’s September 2003 annual conference, and reported by Reuters Health, also demonstrated a link between infants’ antibiotic use and other allergic diseases such as eczema. The link was clear – but which causes which? Are children who have allergic diseases more likely to get sick during the first six months? Or do the antibiotics increase the risk of allergic disease? To some extent both may be true. But controlled studies showing that giving probiotics (active cultures of beneficial bacteria) lowers the risk of allergic disease suggest that these data point to antibiotics actively raising the risk. If antibiotics are important to give, choose the most narrow-spectrum option that would work (antibiotics that kill the desired bacteria, and as few of the bystander bacteria as practical). Whenever a child needs antibiotics, I suggest also giving probiotics to replenish the diversity of beneficial bacteria. Pregnant women and nursing mothers can also take probiotics to protect their children. Probiotics are available as supplements or in foods such as yogurt (for those who are old enough to eat or drink it).